It's a new year - and a new opportunity to start fresh with your goals and intentions! During the turn of the year, people enjoy setting goals and resolutions in the hopes of bettering themselves. 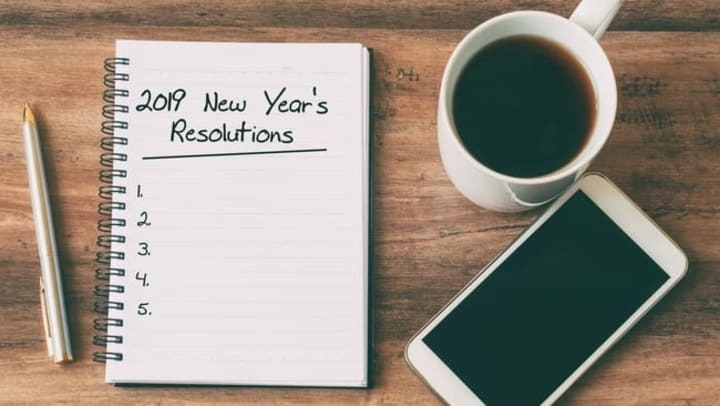 These resolutions can be health related (physically or mentally), financial related, relationship-oriented, or anything you want to try to do differently in the new year! However, resolutions are notorious for being broken, so be sure to keep your goals realistic, and don't get down on yourself if you slip up - just pick up where you left off and try again! Use these tips below to embrace your resolutions and stay on track all year long! It’s easier to slip up on our resolutions when we have no one to hold us accountable. Stay on track by finding a friend, coworker, or family member to join you on the endeavor. Knowing that someone is waiting for you at the gym, or that you’re not alone in turning down sweets can help keep your motivation flourishing. Plus, celebrating milestones with a friend makes it so much more fun. Who knows, maybe it’ll even spark up some friendly competition?! In order to meet your goals, you need to set realistic and attainable expectations. If you know that it’s impossible for you to never grab a sweet again, decide on something more achievable such as limiting sweets to the weekend or substituting healthier options such as dark chocolate or parfaits. If you have never been to the gym before, don’t expect yourself to turn into a gym rat overnight. This isn’t to mean not to push or challenge yourself, but don’t be too hard on yourself when considering your goals. Writing down your goals is a strategic way to measure what you accomplish and lay out the steps needed to get you there. Once you have decided what you want your New Year’s resolutions to be, write them down in your journal along with a timeline and what you need to do to achieve them. The most effective way to keep track of your objectives is to write and reflect in your journal every day. Everybody falls off the wagon now and again – its just human nature. Berating yourself with negative self-talk is not a productive method to get back on track towards your goals. If you’re having a bad day, reflect on how far that you have already come, and vow to make tomorrow better. Being positive and allowing yourself to have setbacks can motivate you to continue on your journey. Who said New Year’s resolutions can’t be fun?! Your New Years resolutions can be anything you want them to be, but you are more likely to realize your aspirations if it’s something you look forward to doing every day. If you make a resolution to learn something new – make sure it’s something you find intriguing. Victory will be oh so sweeter if you treat your self for a job well done. You can choose certain milestones to celebrate, or just reward yourself whenever you feel like you’ve made a strong effort. Don’t consider your reward as cheating! A little break or treat could be the perfect boost you need to keep yourself going all year long. As the year comes to an end and a new one begins, use these tips to keep your New Year's resolutions on track. Always keep in mind that the purpose of resolutions is for self-improvement whether that be mental, physical, social, or other! Take it one day at a time, track your results, and by next year you could be looking back at a whole new you. At Discovery Village At Naples, we are always encouraging our residents to lead their best, happiest, and healthiest lives! We have many tools and programs that can help our residents meet their goals such as social events, wellness activities, and healthy meal options! Visit www.discoveryvillages.com to learn more about our amazing community.